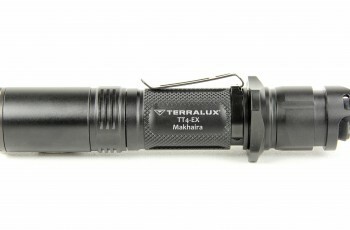 Introducing the advanced TT4-EX Makhaira, a premium illumination tool designed in partnership with Makhaira Group® for self-defense applications. Fashlight Features: Premium CREE LED, delivering a maximum output of 785 ANSI lumens. 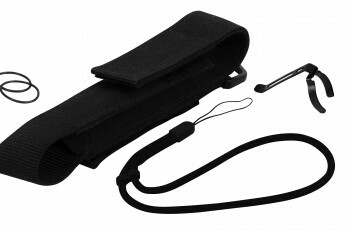 Easy to use dual button tail-switch for quick, one-handed operation. Mode switch provides instant accessto Strobe at all times. Reverse-polarity battery protection. Detachable threaded strike-bezel. Two convenient locations for mounting pocket clip (high/low). Low-battery indicator. Nylon Holster. 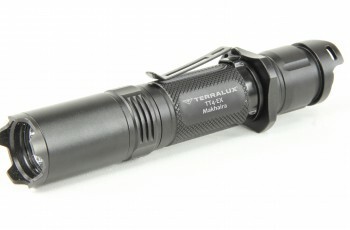 Flashlight Specifications: CREE XM-L (U2) LED with estimated lifespan up to 50,000 hours. Three (3) lighting modes, plus strobe: 785 ANSI Lumens (3 hours)* 200 ANSI Lumens (6.5 hours)* 10 ANSI Lumens (160 hours)* Variable frequency strobe: 785 Lumens (6.5 hours) *Note: Results from testing with TerraLUX 2900mAh 18650 batteries. Working voltage: 3.4V – 8.4V Battery: 1 x 18650 (recommended) or 2 x CR123/A Body color: Matt Black Reflector: Textured (orange-peel) reflector Tactical main power switch (i/o) with momentary activation when off. Dedicated mode switch for instant access to strobe and changing modes. Lens: Tempered, anti-reflection coated, ultra-clear glass.